Kazakhstan stretches across Central Asia from the Caspian Sea in the east to China in the west. The country is famous for many things – it is the largest landlocked country in the world, says Wikipedia – but among food and plant people it is most important as the home of the apple. 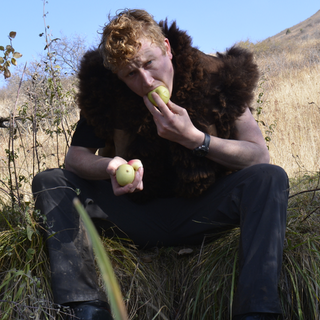 The name of the former capital, Almaty, is often translated as Father of Apples, and it was to Almaty that Ben Reade, today’s guest, recently went with a botanist friend in search of good wild apples. He found them, and much else besides. It is worth pointing out that the now common wisdom – that the domestic apple Malus domesticus was selected from a wild relative Malus sieversii, rather than being a hybrid – has only recently been accepted. Barrie Juniper, of Oxford University, brought all manner of evidence to bear on the question, including some of the first DNA studies of crops. His book, The Story of the Apple is a great read, and some of his knowledge has clearly found its way to his daughter Sarah, The Apple Factor. I also spent a little time looking into Ben’s throwaway remark about “lightly fermented carrot salad”. The New York Times, no less, avers that “Korean carrot salad, morkovcha koreyska, … is a legacy of Stalin’s mass deportations of ethnic Koreans from the far eastern Soviet Union to its western frontiers.” I found a couple of recipes here and here, and although I haven’t tried either, I plan to do so soon. Neither seems to be “authentic,” not least because I’m not sure they would ferment at all. I’d be interested to know more. I Went to the Fatherland of All Modern Apples is Ben Reade’s own account of his trip. The first ever Eat this Podcast consisted of Ben talking about bog butter. The guy gets around. Photos on this page from Ben, and there are lots more in his article.